Holi is a celebration of the onset of spring. Farmers celebrated happy harvest every year at this time and welcomed the season of spring with celebrations. Since then, the tradition of celebrating with dance, music and colours started. Once upon a time, the colours used during Holi were prepared from the flowers of trees that blossomed during spring like flowers of ‘tesu’ or ‘palash’ tree and known as gulal. Most of these trees also had medicinal properties and the colours obtained from them were highly beneficial to the skin and body. 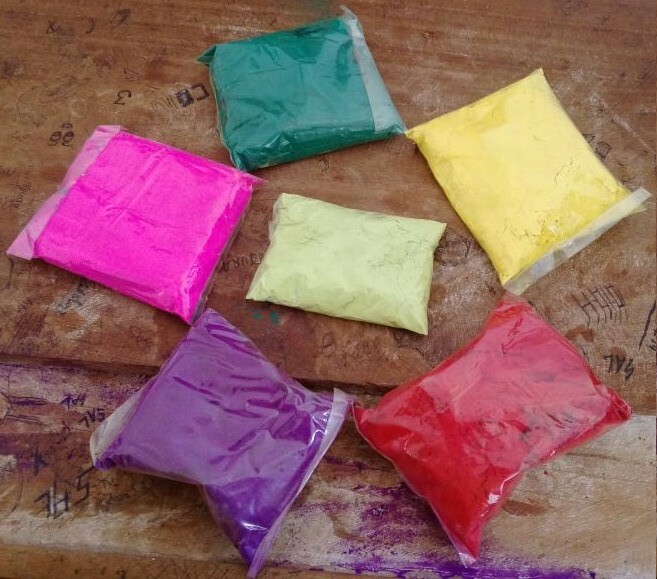 With the rapid commercialisation of this festival and a strong demand for other colours, artificial colours,consisting of a large number of chemicals, became easily available. These poses serious health issues. The best way to prevent any powder from sticking to your skin is to moisturise well beforehand. Some people also oil their hair so that the powder is easier to remove, or wear a hat. It is also recommended that anyone taking part uses home-made powders with ingredients that are guaranteed to be non-harmful or use oraganic colors . One way you can do this is by putting together a mix of flour, water and a few splashes turmeric(yellow), red rose petals(red), jaccarda flowers(blue), mehendi(green). Holi, known as the ‘festival of colors’ is celebrated on the full moon day falling in the month of Phalguna (Feb-Mar). It takes place over two days, and is a celebration of fertility, colour, and love, as well as the triumph of good versus evil. The word "Holi" originates from "Holika", the evil sister of demon king Hiranyakashipu. As per ancient mythology, blinded by special powers King Hiranyakashipu, grew arrogant, thought he was God, and demanded that everyone worship only him. However, his own son, Prahalad refused to worship his father and remained a true devotee of Lord Vishnu. Out of frustration and anger, Hiranya Kasyap tries to kill his son Bhakta Prahlada by using his sister Holika, who is fire resistant, then due to the blessing of Maha Vishnu Prahlada came out from the fire safely but Holika burnt in that fire. Lord Vishnu arrived in the earth as Narasimha avatar and killed Hiranyakashyap portraying the victory of good or evil. Another legend goes with Lord Shiva. Shiva is known for his meditative nature and his many hours spent in solitude and deep meditation. Madana, the God of love, decided to test his resolve and appeared to Shiva in the form of a beautiful nymph. But Shiva recognized Madana and became very angry. In a fit of rage he shot fire out of his third eye and reduced her to ashes. This is sometimes given as the basis of Holi's bonfire. It also draws on the legend of enduring love between Lord Krishna (an incarnation of Vishnu) and Radha. It is said that as a child, Sri Krishna was envious of Radha’s fair complexion, and on the advice of his mother, he went and playfully painted her face so it was the same colour as his. It is said that lovers often celebrate Holi in this tradition, by colouring their faces the same colour during the celebrations. The timing of Holi is synchronised with the moon, which means that the dates of each celebration varies year on year. Holi is split into two events: Holika Dahan and Rangwali Holi. This year Rangwali Holi will take place on 2 March 2018 while the pyres of Holika Dahan will be burned the evening beforehand. Holika Dahan takes place the night before Rangwali Holi. Wood and dung-cakes are burned in a symbolic pyre to signify good defeating evil (According to hindu Mythology, the God Vishnu helps burn the devil Holika to death). This year, Holika Dahan will be celebrated on March 1. Timings for the Holika Dahan will be from 6 pm to 8: 30 pm after the Bhadra period is gone. The next morning, people gather in public spaces and take part in Rangwali Holi. This is a raucous affair where people chase each other around, throwing handfuls of coloured powders (known as gulal) at one another, while getting drenched in water. Social gatherings such as parties with food are organized at several places. Parties, and spending time with friends, family and other loved ones are also crucial aspects of Holi. Moreover, giving out sweets and delicacies is another important part of the festival’s celebrations. That’s why this festival is also known as the Festival of Spreading Joy. Holi is a relatively secular one. People take part in Holi all around the world, but it is celebrated the most in parts of India and Nepal. This year Google is celebrating Holi with a new festive doodle that seeks to bring out the colourfulness associated with the festival. 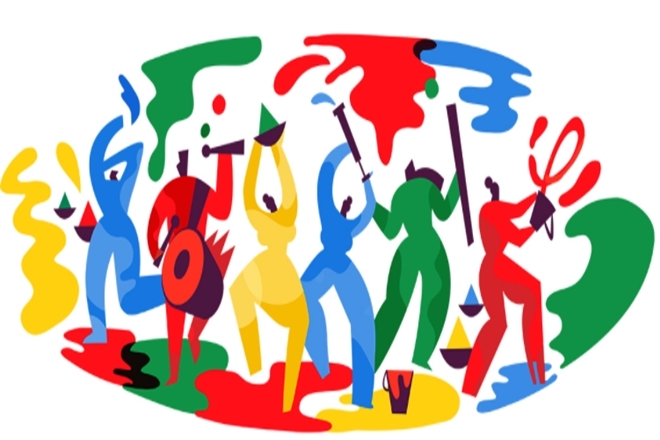 Characters in blue, red, yellow and green celebrating Holi replace the traditional Google logo that has its letters painted with those very colours. The Google Doodle depicts dhol players, those who love spraying colour through pichkaaris and those who colour others with traditional gulaal as well. The festival, which marks the end of winter and the coming of spring, symbolically shows the triumph of good over evil. The four main colors of Holi in the Google Doodle represent many different things that are in line with the festival. Red stands for love, yellow is the colour of turmeric, which is a powder used as an anti-septic, blue represents the Hindu god Krishna and green symbolises new beginnings with the coming of spring. The Google Doodle has been designed by Amrita Marino.